by Nathan Hill. 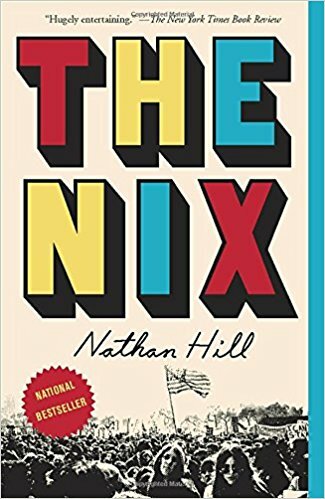 Former St. Thomas English professor ​Nathan Hill’s debut novel, "The Nix," was named the No. 1 book of the year by Audible and Entertainment Weekly, as well as one of the year’s best books by The New York Times, The Washington Post, NPR and many others. It will be published worldwide in 30 languages. Oh, and it has been optioned for TV by J.J. Abrams, with Meryl Streep lined up to star. ... Wait. What? Wow. It’s 2011, and Samuel Andresen-Anderson hasn’t seen his mother, Faye, in decades—not since she abandoned the family when he was a boy. Now she’s reappeared, having committed an absurd crime that electrifies the nightly news and inflames a politically divided country. The media paints Faye as a radical hippie with a sordid past, but as far as Samuel knows, his mother was an ordinary girl who married her high-school sweetheart. Which version of his mother is true? Two facts are certain: she’s facing some serious charges, and she needs Samuel’s help. To save her, Samuel will have to embark on his own journey, uncovering long-buried secrets about the woman he thought he knew, secrets that stretch across generations and have their origin all the way back in Norway, home of the mysterious Nix. As he does so, Samuel will confront not only Faye’s losses but also his own lost love, and will relearn everything he thought he knew about his mother, and himself.